A pet owners worst nightmare is having their dog get loose, especially when the location is foreign to the dog. 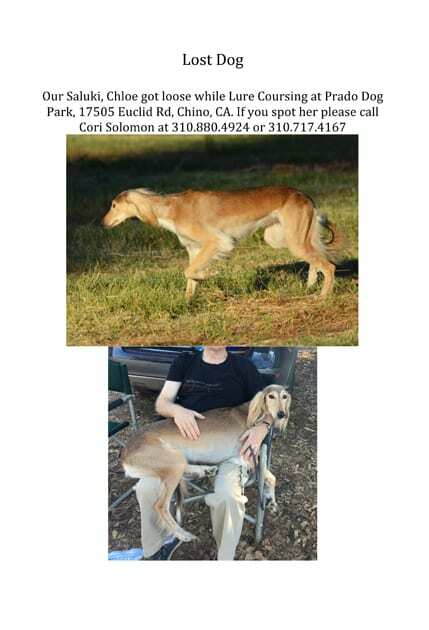 Such was the case when we took our Saluki, Chloe lure coursing at Prado Dog Park in Chino. Here is my story of a lost dog rescue. 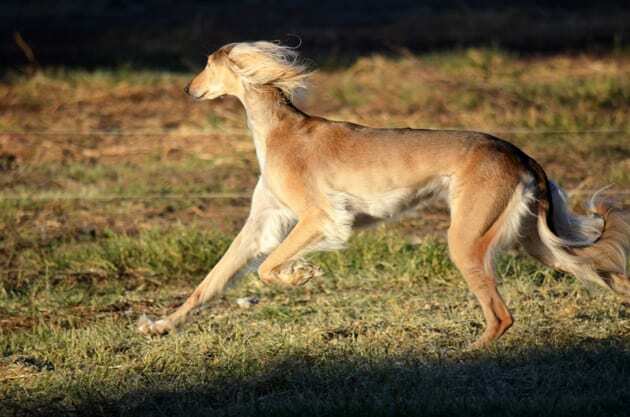 Salukis were bred to hunt gazelle and rabbits, so they love to run. At home, Chloe is a reasonably obedient dog usually coming when called. My husband, Ken, and I thought it would be fun to let her run off some steam by taking her lure coursing. 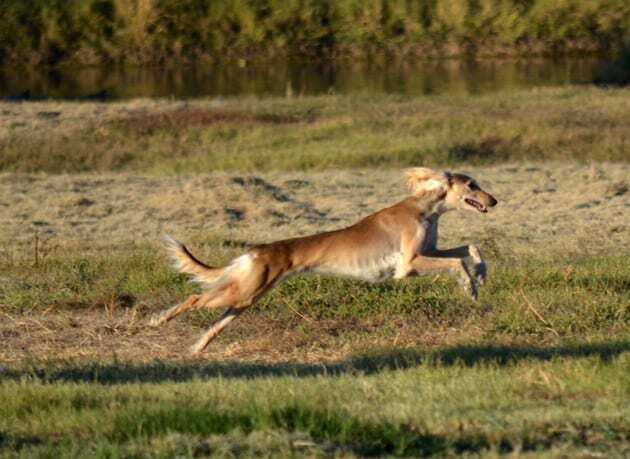 Lure coursing is a continuous loop run on a pulley system where the dogs chase plastic bags. The lure simulates hunting. It is wonderful watching each dog’s exuberance, comfortably pushing themselves by running to the limits of their ability. You can see smiles on their faces as they are running and you know that they are in their true element. Chloe sitting in Ken’s lap while waiting for her turn at the lure Course. When we first arrived at Prado Dog Park, Chloe acted shy. Our 40 lb. 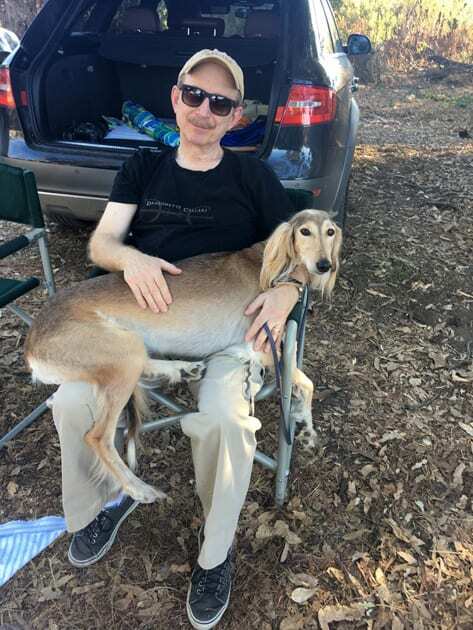 Saluki gravitated to our laps. For a dog, anticipation entices them to lure course. At first, Chloe showed no desire, but while waiting her turn, she became attentive. Upon release Chloe was hesitant, and I began to trot with her until she took off on her own. She started out beautifully taking the turns and staying on course, but after a few turns, she lost the lure. The operator stopped the lure for a few minutes before beginning again. Chloe heard the lure and started running but not quite in the right direction. Happy Chloe Running the lure course. Looking aghast, I saw Chloe dart past the generator and into the next field. I started running after her; however, I am no match for a Saluki. A group gathered to follow her. She stopped on a mound, and as we approached, she took off again. We could not see where she went yet the group continued to search. As the sun set someone suggested that I stay overnight in the park. Instead, we opted to return home to organize the next day’s search. We left a few personal items, the sheet she sat on in our car, a towel and Ken’s cap nearby the lure course hoping the scents would entice her back. 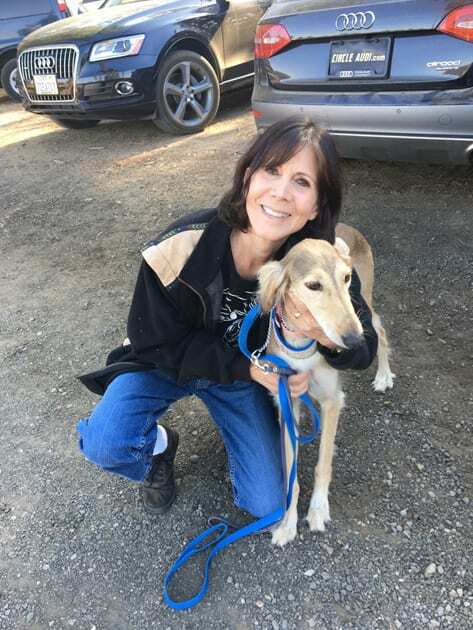 On our way home I put out a post on Facebook asking Southern California Saluki owners to join us in our lost dog rescue. I also contacted friends, who had led searches for lost dogs. By the time we got home, I already had two recruits and had material on how to find a missing dog. 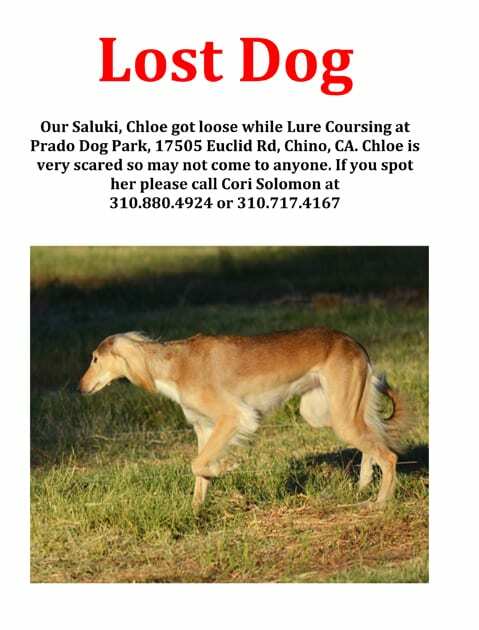 Fortunately, we took pictures of Chloe at the park and utilized those in a flyer, which I then posted on Facebook. It immediately went viral. 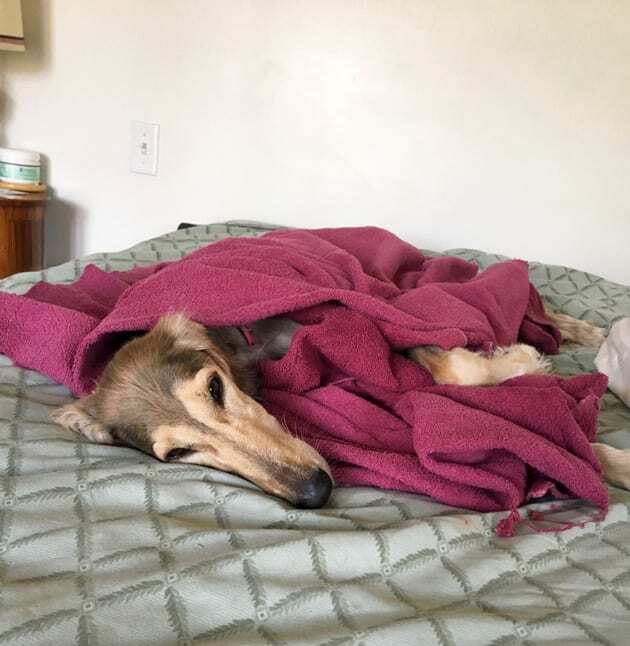 With all the shares and comments from both people in the Saluki and dog world as well as my other friends, we amassed about ten volunteers for the next day. I also contacted an animal communicator, who used a spiritual bend to assist in bringing Chloe to me. Being already practiced in the art of creative visualization, I began imagining Chloe coming to me and surrounding her in the white light to protect her. My husband and I felt we would do whatever it takes to get Chloe back. The most significant toll on us was our lack of appetite and sleep. We worked on adrenaline. By 7 am we received a call from the park owners, saying Chloe was sighted in the cornfields. My mother and I plus our other two Salukis, Zoe and Ami, took off for the park. I sped to Chino, and if a cop had been around, I would have gotten a hefty ticket. Upon arrival, we began looking for Chloe with no luck. We received another sighting, a false alarm causing a group of us to search another area of the park. Soon after, I received a call telling me Chloe had returned to the cornfield and sure enough she was there. I grabbed Ami, some of Chloe’s favorite treats and started traipsing across the cornfield towards Chloe as the other searchers stood back. Chloe nervously moved back and forth. As I got within 500 feet, Chloe darted into the brush. In hindsight, I should have sat on the ground and spoken to her softly hoping she would come to me. Instead, I walked up to the brush sat down and called her. I sat for the longest time not hearing any movement. Finally, one of the searchers decided to go into the bushes and discovered the culvert leading under the freeway to the opposite side. 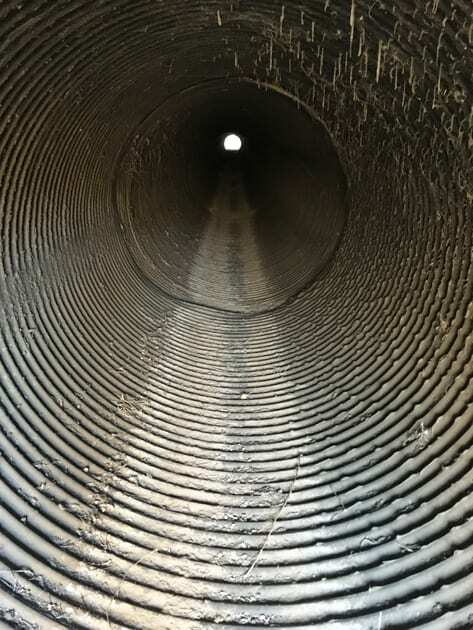 At this point, we parked my car near the culvert, and a group of us went through the tunnel to search for Chloe. A 3-year old child spotted Chloe running an hour before. The terrain appeared more vast and hilly on this side of the freeway. A feeling of dread consumed me as the hours passed, while friends started posting flyers in the neighboring communities. As the day dragged on it became apparent Chloe would not be coming home. We decided to leave water, food and personal items on each side of the culvert, hoping to draw Chloe back to the park side of the freeway. I also left things with both my scent and that of our other dogs on them. The piece de resistance occurred when I was coerced willingly to pee in several places spots and to leave my underwear in the middle of the tunnel. Chloe was not going to miss my aromas; even if the task is not an easy feat for a woman. 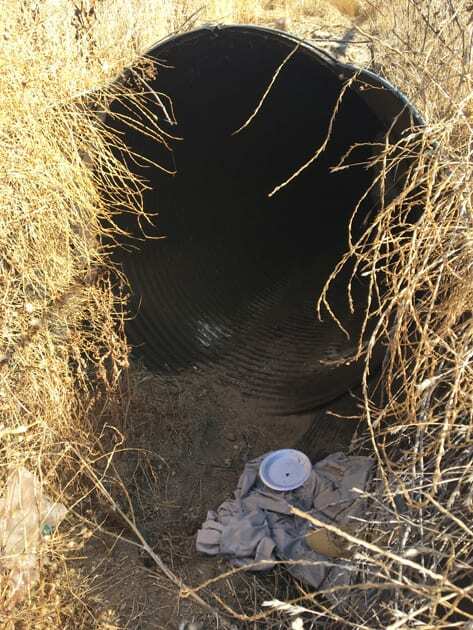 Culvert entry with personal items. Upon our return home, we redesigned our Lost Dog poster as recommended by Laura Leland Montague, Chino Valley Missing Pets and set out to get new volunteers for Sunday. Ken and I started at the top of where Chloe had been last sighted. As we drove the ridge Ami, Chloe’s uncle began crying. Did he sense her presence and perhaps our car sent her back into the culvert? We returned to the park side where we ran into Laura, who mentioned she found some fresh poop down the road along with paw prints from an animal with long nails. I believe this was a good sign as I confessed I neglected to cut Chloe’s nails before the lure coursing event. For some reason, I made a conscious decision to wait until after the event to trim everyone’s nails. We decided first to investigate the culvert with our friend Janie Krupela. We discovered the food at each end of the tunnel had been eaten. I found a small poop in the middle of the culvert that looked like Chloe’s. We then proceeded to check the poop on the road. Chloe’s ears were entirely matted together, and she was crying. I decided just to clip her ear feathering, as it would grow back. 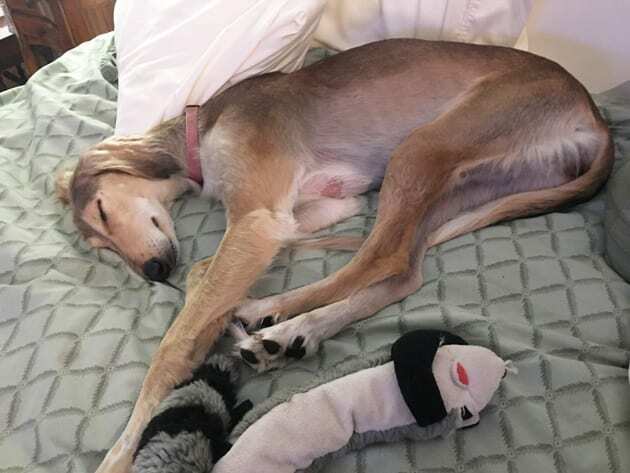 She now looks like a Pippi Longstocking Saluki meets a tomboy but who cares because she is home and safe. Upon returning home, Chloe went from the car to the bathtub after which she immediately fell into a sound sleep. Chloe home resting after a bath. Chloe went to the vet and was given antibiotics for the bruises she had sustained during her adventure, but otherwise received a clean bill of health. 1. Getting the word out immediately is vital. Facebook can be an excellent source of networking to help recover a dog. One posting received 188 shares, another 115 shares, and a third one 45 shares. By sharing, the Chino community was made aware of my lost dog, and many of those people came out to help. 2. Get the word out to Nextdoor, a private social networking service for neighborhoods. Most communities now use Nextdoor as a means of communication. 3. Know that a dog sometimes becomes semi-feral when they get loose, and that instinct keeps them from coming back to you. 4. If you cannot find your dog, there are some excellent trackers out that that can assist in getting your dog back. We were ready to hire one if Chloe had not been found. 5. Create a good poster and go door-to-door handing it to people. Also, ask people to put your phone number in their smartphone under the name “dog” or “missing dog” in case they see your dog and do not have your flyer with them. 6. 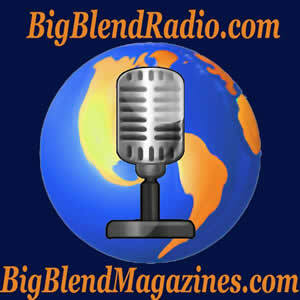 Finally, I will end by saying never doubt the power of prayer and creative visualization. I prayed to the universe every night before I went to bed. It helped me sleep a bit, and it may put you in a better place to find your own missing pet.